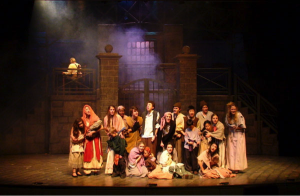 Otterbein University’s nationally recognized Theatre Program has offered countless actors and actresses their professional beginnings, however some believe that it also offered one student a final curtain call. As the story goes, a young aspiring actress and student named Twyla became despondent after learning that she had been passed over for a part that she had hoped to earn. Following a period of depression, she decided to end her life as theatrically as she had lived it. One evening, upon returning to the theatre, she climbed to the light fixtures above the stage and jumped 30 feet to her death. 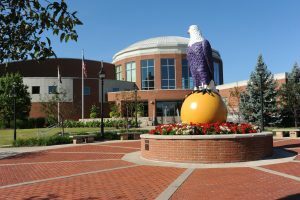 Administrators claim there never was a Twyla at Otterbein, but some students and faculty aren’t quite so sure. In fact, over the years, many have blamed Twyla’s spirit for everything from power outages and cold blasts of air to missing lighting cues and disappearing stage props. Others have reported hearing Twyla crying on quiet nights in the theatre. Some just claim to “feel her presence.” In past years, students repeatedly reported slipping on the very spot where Twyla was reported to have hit the stage when she fell. One evening a noose was said to have suddenly appeared hanging from the lights above the stage. Of course Twyla received the credits that night! 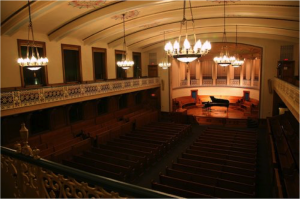 So, is Otterbein’s Fritsche Theatre really haunted? We can’t say for sure, but if you ever attend a performance, you might consider remaining in your seat for just a few moments after the room empties and the lights dim. If the hairs on the back of your neck stand up and a rush of cold air passes, perhaps it’s just Twyla nodding to you as she exits stage right! 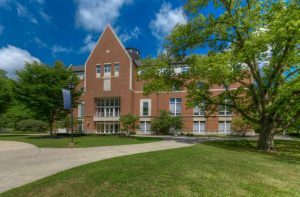 Ghost Stories from Ohio’s Colleges – This year’s journey begins! Now that we are past our bout with Indian summer, the road ahead reveals a landscape more vibrantly colorful and distinctly brisk. 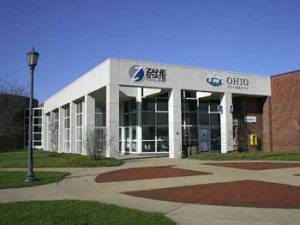 It is during these beautiful fall days leading up to Halloween that we fondly recall all the campus ghost stories we heard as we toured Ohio colleges. Some campuses boasted multiple spirits; others had formed paranormal investigative student organizations; and still others defended their campus as “the most haunted campus in Ohio.” We took notes. Before it was over, we realized that these stories were more than simple frightful tales – they told us about the college’s history; its values; its best academic programs and athletic teams; its most historic buildings; and even its core values. We hope you will be scared and inspired! In each of the next four blog entries we will offer one of our favorite stories. We begin with the story of “Twyla,” the ghost that haunts the theatre at Otterbein University. Next up are the benevolent ghosts that arrived just in the nick of time to save Ohio Dominican University from financial ruin. Then, on to Kenyon College where we meet the “Greenhouse Ghost” that haunts the old Kenyon pool. We will conclude at Lake Erie College where “Stephanie” haunts College Hall, but occasionally attends a performance at nearby Morley Music Building using a broken mirror as a portal to get there (I wish I had one of those!). Buckle up – let’s get started! In 1968 Nevitt Sanford published the book, “Where Colleges Fail: A study of Student and Person.” His work was the launching point of a conceptual model that I have long relied upon in thinking about how students transition, grow, and develop while in college. In today’s blog, I want to explain the model and describe how it can be used to help you and your student. Simply put, Sanford argued that students (and everyone else incidentally) grow and develop when there is some balance between the challenges we face in our life and the supports we draw upon to help us manage them. If the challenges outweigh the supports, we may feel stressed and overwhelmed leading to burnout or shutdown. 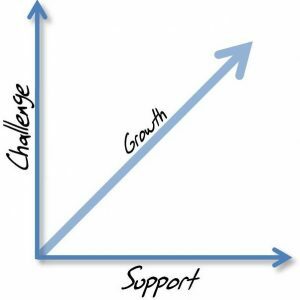 If supports outweigh challenges, we may feel comfortable but not stretched. On the other hand, if we face challenges outside of our comfort zone, and receive sufficient and helpful support, we are more likely to grow, develop, and expand our capacities and capabilities. Of course this is our goal, so there may be appropriate times to seek support and others to seek challenge. A couple of observations: First, transitional points in our lives such as losing a job, ending an important relationship, making a geographic move, or…..going away to college tend to be naturally fraught with high levels of challenge. These key touchstone turning points in our lives may lead us into a sense of a loss of control and feelings of uncertainty or even outright panic. In kids, we may call it “homesick;” in adolescents we may call it, “acting out;” and in adults it has been called a, “nervous breakdown.” You get the idea. Second, while transitional challenges are strikingly evident as they occur, supports often need to be acquired or sought out intentionally. Finally, navigating these high challenge, transitional times of our lives always takes time. A wise friend of mine used to say, “fake it until you make it.” I think he was talking about the lag between being jettisoned from our comfortable life as knew it into a period of transition and the point when we actually become acclimated to our new circumstances, happy, and capable in terms of the challenges it presents. It just takes time. However, in addition to time, the ability to seek helpful support as needed can make all the difference. 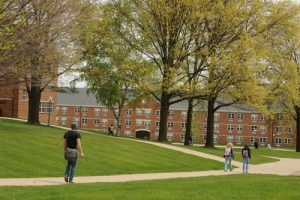 For the student transitioning to college, the most important question relates to how to intentionally seek healthy support until he or she feels “at home” again. In prior blogs I have identified a number of immersive experiences a student can engage in college in order to develop new authentic and supportive relationships (e.g. 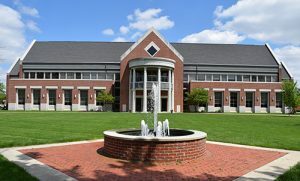 student organization leadership, social fraternity or sorority membership, participation in athletics, band, theatre, or others) while connecting to their new college. Students can also utilize campus resources by visiting with a counselor, faculty member, or student services staff. Periodic trips home, hosting friends from high school in their dorm, and engaging activities they enjoy can play a role as well. In terms of your student’s transition to college, you can coach your student on navigating this natural but often challenging process. Normalize it for them – we all go through these times. Assess what you think might be helpful to them. Suggest how they might acquire additional support. Make sure they understand that it will take time – there is no quick answer. Of course, you cannot solve this for them – they must solve it for themselves…with support from others. Welcome to the human condition and thanks for hiking with us today. Next week I will post our most recent newsletter in lieu of a blog entry. That sets the stage for the lead up to Halloween and the beginning of our series of ghost stories from Ohio’s colleges. Don’t miss it. In this blog series we have already examined both the Core Curriculum and Major requirements a student must complete in order to graduate. This time, we will look at “Free Electives,” which are the number of remaining credit hours required for a degree (degree = 120 credit hours) that have not been used up in satisfying Core and Major requirements. Generally speaking, the more Free Elective credit hours available, the better. They are like currency that can be spent on achieving a “Minor,” or focused area of study in an area different from the student’s Major. A Minor typically requires 15-21 credit hours. They may also be used to help a student earn a second or “ Double Major,” or Certificate. Finally, Free Electives can be spent on individual courses that the student chooses to take for fun, interest, or professional development purposes. Students can maximize their number of Free Electives by selecting Core courses that simultaneously satisfy Major requirements (e.g. a Major course in Economics may also satisfy a Core Social Science requirement, etc.). A student’s advisor can help them maximize these “Double Dip” opportunities as well as plan for how to calculate and spend their remaining Elective credit hours. Some Majors require only 36-48 credit hours leaving plenty of room for Free Electives while others require 50-75 leaving little room. The student’s goal beyond their Core and Major requirements is to “spend” their Electives to their greatest advantage. Some may wish to add a credential or explore an interesting new area of study by adding a Minor or Certificate. Others may pick and choose individual courses for any of a variety of reasons. Since students cannot control their Core or Major requirements (except for maximizing “Double Dip” opportunities), we recommend that they be more planful and strategic in the use of their precious Free Electives. 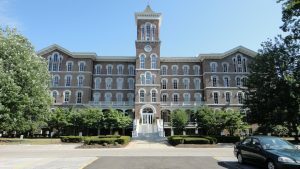 Over the next few weeks I will offer a few more blog entries related to student success and then we will hike into our annual “Haunted Colleges in Ohio” series. These are my most popular entries – go figure. This year I have some great tales of fright from Ohio’s colleges to offer, so prepare to strap in for the ride. 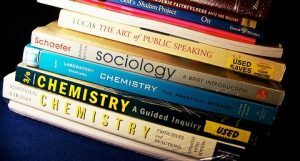 In our last blog, we looked at how a college curriculum is organized and then looked more closely at the Core Curriculum (General Education) Requirements. In this discussion, we will look more closely at the Major. In addition to completing a college’s Core Curriculum, college students select a “Major” area of study. Major requirements may vary significantly from Major area to Major area, or between colleges in the same Major area. For example, an Accounting Major will typically be much more extensive (require more credit hours) than a History Major. So, it would be much easier for a History major to add a Minor or Double Major as compared to an Accounting major. Additionally, the requirements for a History or Accounting major may differ markedly between colleges. The tradeoff – the more significant the Major requirements, the fewer electives are available for students to Double Major or select a Minor. As a general rule of thumb, Professional Majors such as Business, Nursing, or Engineering tend to require more credit hours than those in other disciplines. The reason for this is that Professional Majors are often informed by specialty accreditor requirements, state licensure requirements, or other professional standards that extend required coursework. Students majoring in Art-related disciplines (e.g. Music, Dance, Illustration, Graphic Design, etc.) should carefully explore Major credit hours as these may vary greatly between colleges even given identical Majors. The Major curriculum is typically composed of (1) Major courses (courses IN the Major area of study); Correlatives (courses outside the Major area of study, but required by the Major), and; (3) Major “Pick From” lists of courses from which students may choose a prescribed number of courses. These courses may be in the Major area of study or outside it and typically allow students to specialize a bit. So, for example, a student majoring in Accounting would be required to complete a set of Major Accounting courses such as Financial Accounting, Managerial Accounting, Personal Taxation, Auditing, and others. Additionally they might be required to take Correlatives (additional courses outside of Accounting) such as a course in Management, Statistics, Finance, Marketing, Human Resources, or others. Finally, they may be required to select a small number of elective courses from a longer list. These options allow students to tailor their Accounting Major to respond to more specific career objectives. Options might include Entrepreneurial Accounting, Introduction to QuickBooks, Non-Profit Accounting, etc. Each Major is structured differently and differences exist in the same Major at different colleges as well. This is one reason why, at CBA, we recommend that students and their families meet with a faculty member in each Major they are considering at each college they are considering. In that meeting, the student can ask the faculty member to explain the organization of the Major courses. It sounds technical, but once you hear a faculty member explain their Major course sequence at three different colleges, it will become more clear which college has a thoughtfully designed Major with many options and those that are more rigid and/or guided by tradition. Next time, we will look at Free Electives and how a student can use these to his or her advantage.